On Monday October 22, we made a cautious decision to publish the grade 9 Mathematics examination questions which the pupils were scheduled to sit for on Tuesday the 23rd of October. As a direct consequence, government through the Ministry of Education nullified the exams because of what they have acknowledged as the wide spread “infiltration into the examination.” The ministry further suspended all examinations at secondary school. A negligible section of society has blamed us for this cancellation of exams. For the record we have no regrets for that editorial decision we made on Monday. As we have always stated, our loyalty is to the people of Zambia, especially the most vulnerable in our society. 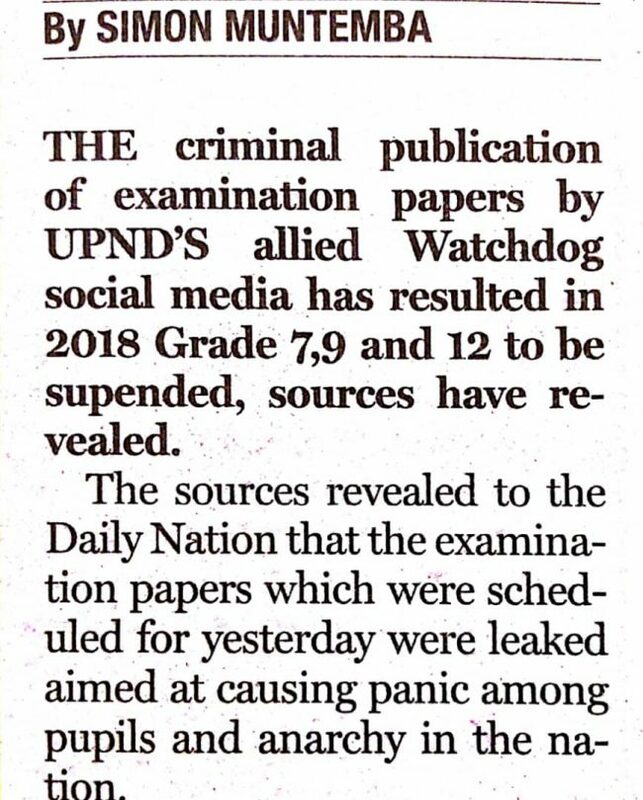 For many years these leakages have been happening and nothing seems to be done by those charged to maintain the integrity of these examinations. What kind of society do we want to create with the frauds we are producing through our education system which celebrates cheating? The most deserving of our children are being denied the opportunity to excel because of these leakages. The dull ones now seem to be more intelligent because their parents are in a position to buy leakages. This can not and should not be allowed. The leakages for this year’s exams seem to have worsened to a point where they were being sold for as little as K15 per paper. The leakage was being sold in the market place like fritters (vitumbwa). They were being sold at Chawama, Kanyama, Misisi, Chilenje market and elsewhere. The leakages were being forwarded on WhatsApp for a fee. And the government wants to say they were not aware of this? What else are they not aware of? This is unacceptable. And we expect to develop our country with human resource that is produced out of such an education system? Was it not just the other day when Universities in Europe downgraded Zambian Universities to college statuses? What does that actually mean practically? It means that, if you graduate from UNZA, CBU even with a distinction, you cannot be admitted for a master’s degree in other universities because in the eyes of those universities, UNZA, CBU, Mulungushi are not universities but colleges. It means there is no university in Zambia. If UNZA, Mulungushi, CBU and those other things have been downgraded to college level, then Zambian colleges have been downgraded to application forms. But what has caused this? What has made Universities in UK and other places see that there is something wrong with the quality of education in Zambia? These universities receive and process applications for admission from Zambian applicants. Most of these applicants have very good grades on their supposedly certificates. But when they are subjected to aptitude tests, they fail. When they are invited for face to face interviews, they fail. Those who do not go through aptitude tests of other forms of assessments before being admitted, they flank in their first year at those foreign universities where getting a leakage of the exam is impossible. But the ministry of education wants us to believe that they are not aware of these weaknesses where imbeciles are sent into universities because of a porous examination regime in Zambia? With such imbeciles ‘graduating’ from our tertiary educational facilities , is it a wonder that our economy is in the hands of people who are hardly literate but with distinctions on their certificates? Can you develop like that? We actually commend the government and the Ministry of Education for heeding to our advice to nullify those exams. It was the right decision to make. Let the children compete on an equal basis. These children buy their way to university where they also go and continue to cheat to attain education credentials. As a country we are producing nothing but functional illiterates. Someone graduates from the university and they can’t even spell their own name. It is high time that the Examination Council of Zambia (ECZ) tightened security on these examination papers. Someone needs to put a stop to this nonsense of leakages. We never respond to criticism from people, but we have been alerted to insinuations by convicted criminal Richard Sakala that our aim was to cause confusion in the country by publishing the leakage. A little Journalistic tutorial to the convict: media is supposed to be the mirror of society. The publication of that paper was just to show how rotten our society is. We however understand that Sakala as a convict would not understand this as it is beyond him and his corrupt tented head. If we were corrupt like Sakala, we could have just joined the queue and start selling the leakages. Sakala himself is a product of fraud, so these things naturally attract him. Let him publish his journalism qualification or any academic qualification for that matter in his toilet newspaper. He has none, unless he forged one. Yes, it is expensive that other papers have to be printed but if it is going to promote equity and restore public confidence in our education system so shall it be. We therefore offer no apologies for that expose. It is more expensive to send children who can’t read into society than to reprint a few papers, after paper is cheap in China, our friendly nation and ally. If the next papers will be leaked, we shall publish them again.